From an address given to Church Educational System educators at Brigham Young University on 13 August 1996. The two major purposes of the law of sacrifice are to test and prove us and to assist us in coming unto Christ. A few years ago, my family and I visited Palmyra, New York; Kirtland, Ohio; and Nauvoo, Illinois. We reviewed the early history of the Church on that trip and were reminded of the overwhelming sacrifices the founders of the Church made to establish the kingdom of God in this last dispensation. Reflecting upon their humble obedience focused my mind on the eternal nature of the law of sacrifice, a vital part of the gospel of Jesus Christ. It was practiced in Old Testament, New Testament, and Book of Mormon times. While its practice changed during the New Testament period, the purposes of the law of sacrifice remained in place even after the Atonement of Christ fulfilled the law of Moses. Usually, the first thing people think of when they hear “law of Moses” is animal sacrifice. The somewhat gruesome nature of blood sacrifice has led some to ask, “How could such an activity have anything to do with the gospel of love?” We can better understand the answer to that question when we understand the two major purposes for the law of sacrifice. These purposes applied to Adam, Abraham, Moses, and the New Testament Apostles, and they apply to us today as we accept and live the law of sacrifice. Its two major purposes are to test and prove us and to assist us in coming unto Christ. “I have decreed in my heart, saith the Lord, that I will prove you in all things, whether you will abide in my covenant, even unto death, that you may be found worthy. “For if ye will not abide in my covenant ye are not worthy of me” (D&C 98:14–15; emphasis added). The law of sacrifice provides an opportunity for us to prove to the Lord that we love Him more than any other thing. As a result, the course sometimes becomes difficult since this is the process of perfection that prepares us for the celestial kingdom to “dwell in the presence of God and his Christ forever and ever” (D&C 76:62). Next, President Ezra Taft Benson (1899–1994) explained that “the sacred mission of the Church … [is] to ‘invite all to come unto Christ’ (D&C 20:59)” (“‘Come unto Christ, and Be Perfected in Him,’” Ensign, May 1988, 84; see also Moro. 10:32). In that light, the law of sacrifice has always been a means for God’s children to come unto the Lord Jesus Christ. How does sacrifice help us come unto Christ? No one will ever accept the Savior without having faith in Him first. Hence, the first principle of the gospel is faith in the Lord Jesus Christ. Accordingly, the Prophet Joseph Smith (1805–44) explained an important relationship between the principle of faith and the principle of sacrifice: “Let us here observe, that a religion that does not require the sacrifice of all things never has power sufficient to produce the faith necessary unto life and salvation; … it is through the medium of the sacrifice of all earthly things that men do actually know that they are doing the things that are well pleasing in the sight of God. When a man has offered in sacrifice all that he has for the truth’s sake, not even withholding his life, and believing before God that he has been called to make this sacrifice because he seeks to do his will, he does know, most assuredly, that God does and will accept his sacrifice and offering, and that he has not, nor will not seek his face in vain. Under these circumstances, then, he can obtain the faith necessary for him to lay hold on eternal life” (Lectures on Faith , 69). To summarize: we must know what we do is pleasing before God and understand that this knowledge comes to us through sacrifice and obedience. Those who come unto Christ in this way receive a confidence that whispers peace to their souls and that will eventually enable them to lay hold upon eternal life. Sacrifice allows us to learn something about ourselves﻿—what we are willing to offer to the Lord through our obedience. “It was clear that [President Brown], nearly ninety, had thought and prayed and wept over that question before. He finally said, ‘Abraham needed to learn something about Abraham’” (The Highest in Us , 49). Now let’s look at another way the law of sacrifice brought people unto Christ. Anciently, blood sacrifices brought the people to Christ through typifying and foreshadowing His life and mission. Adam was taught that the sacrifice on the altar was “a similitude of the sacrifice of the Only Begotten of the Father” (Moses 5:7). This teaches us that originally our Father’s children understood the relationship between the sacrifice of their offerings and the sacrifice of the Lamb of God (see D&C 138:12–13). It is in the Book of Mormon that we find some of the clearest doctrinal teachings about the purpose of the law of sacrifice as practiced under the law of Moses. Nephi taught that it was done to typify the sacrifice of Christ (see 2 Ne. 11:4). He wrote: “We keep the law of Moses, and look forward with steadfastness unto Christ. … For, for this end was the law given” (2 Ne. 25:24–25). In Alma we read: “They did look forward to the coming of Christ, considering that the law of Moses was a type of his coming. … The law of Moses did serve to strengthen their faith in Christ” (Alma 25:15–16). The Prophet Joseph Smith taught: “Whenever the Lord revealed Himself to men in ancient days, and commanded them to offer sacrifice to Him, … it was done that they might look forward in faith to the time of His coming, and rely upon the power of that atonement for a remission of their sins” (Teachings of the Prophet Joseph Smith, selected by Joseph Fielding Smith , 60–61; see also page 58). President Spencer W. Kimball (1895–1985) once explained to a young man struggling with his testimony that effort and struggle are necessary if we are to be saved through Jesus Christ. He told my friend, “Through sacrifice and service one comes to know the Lord.” As we sacrifice our selfish desires, serve our God and others, we become more like Him. “We are still commanded to sacrifice, but not by shedding blood of animals. Our highest sense of sacrifice is achieved as we make ourselves more sacred or holy. “This we do by our obedience to the commandments of God. Thus, the laws of obedience and sacrifice are indelibly intertwined. … As we comply with these and other commandments, something wonderful happens to us. … We become more sacred and holy﻿—[more] like our Lord!” (“Lessons from Eve,” Ensign, November 1987, 88). Our first lessons about the law of sacrifice, as well as other gospel principles, began in our premortal life. We were taught the fulness of the gospel and the plan of salvation (see D&C 138:56). We knew of the Savior’s mission and of His future atoning sacrifice, and we willingly sustained Him as our Savior and our Redeemer. In fact, we learn from Revelation chapter 12 verses 9 and 11 that it is “by the blood of the Lamb” (Christ’s atoning sacrifice) and our testimony that we are able to overcome Satan. President Joseph F. Smith (1838–1918) explained: “The Lord designed in the beginning to place before man the knowledge of good and evil, and gave him a commandment to cleave to good and abstain from evil. But if he should fail, he would give to him the law of sacrifice and provide a Savior for him, that he might be brought back again into the presence and favor of God and partake of eternal life with him. This was the plan of redemption chosen and instituted by the Almighty before man was placed on the earth” (Teachings of Presidents of the Church: Joseph F. Smith , 98). Adam and Eve were taught the law of sacrifice and were commanded to practice it by giving offerings. These included two emblems: the firstlings of the flock and the firstfruits of the field. They obeyed without questioning (see Moses 5:5–6). President David O. McKay (1873–1970) pointed out, “The effect of this [law] was that the best the earth produced, the best specimen in the flock or herd should not be used for self, but for God” (“The Atonement,” Instructor, March 1959, 66). At a time in history when it was a struggle to make sure the family had food, those who sought to worship the Lord were asked to sacrifice the best part of their source of life. It was a real test of Adam and Eve’s faith, and they obeyed. Likewise, Abel, Noah, Abraham, Isaac, Jacob, and all the holy prophets from Adam to Moses offered to the Lord sacrifices in a similar way. Because of the rebellious nature of the children of Israel in the days of Moses, the practice of the law of sacrifice was changed; it became a strict law requiring daily observance of performances and ordinances. During the time of Moses there was an expansion in the number and variety of offerings under the law of sacrifice. The Mosaic sacrifices consisted of five major offerings that fell into two primary categories﻿—obligatory and voluntary. The difference between the obligatory and the voluntary offerings might be compared to the difference between the law of tithing and the law of fast offerings. One thing remained the same in all of these offerings: everything about Mosaic sacrifice focused on Christ. Like Christ, the priest acted as the mediator between the people and their God. Like Christ, the priest had to have the right parentage to officiate in his office. Like Christ, the offerer through obedience willingly sacrificed what was required by the law. The part of sacrifice that most strongly paralleled the Savior was the offering itself. Notice with me some of these parallels. The law of sacrifice with its system of offerings given to Moses was still being practiced in New Testament times. Jesus Christ of the New Testament was Jehovah of the Old Testament﻿—He who gave the law of Moses in the first place, prescribing elements of the law that specifically pointed to His future atoning sacrifice. He was, then, the one with authority to fulfill that law, and His final words﻿—“It is finished” (John 19:30)﻿—indicate that this had been done. “And behold, this is the whole meaning of the law, every whit pointing to that great and last sacrifice; and that great and last sacrifice will be the Son of God, yea, infinite and eternal” (Alma 34:13–14). Now, here is a very important truth: We should understand that the law of Moses is not the same thing as the law of sacrifice. While the law of Moses was fulfilled, the principles of the law of sacrifice continue to be part of the doctrine of the Church. The primary purpose of the law of sacrifice still is to test us and assist us in coming unto Christ. After the Savior’s ultimate sacrifice, two adjustments were made in the practice of this law. First, the ordinance of the sacrament replaced the ordinance of sacrifice; and second, this change moved the focus of the sacrifice from a person’s animal to the person himself. In a sense, the sacrifice changed from the offering to the offerer. Are affected by a person’s attitude and worthiness (see Amos 5:6–7, 9–10, 21–22; 3 Ne. 18:27–29; Moro. 7:6–7). Are designed to be performed by priests officiating in the Aaronic Priesthood (see D&C 13:1; D&C 20:46). Focus on Christ (see Luke 22:19–20; Alma 34:13–14). Use emblems that represent Christ’s flesh and blood (see Luke 22:19–20; Moses 5:6–7). Provide a means whereby one can make and renew covenants with God (see Lev. 22:21; D&C 20:77, 79). Are performed regularly on the Sabbath as well as on other special occasions (see Lev. 23:15; D&C 59:9–13). Are associated with meals that symbolically represent the Atonement (see Lev. 7:16–18; Matt. 26:26). Are the only saving ordinances in which members participate for themselves more than once. Provide an important step in the process of repentance (see Lev. 19:22; 3 Ne. 18:11; Moses 5:7–8). President Joseph F. Smith said that the purpose of the sacrament “is that we may keep in mind continually the Son of God who has redeemed us, from eternal death, and brought us to life again through the power of the Gospel. Before the coming of Christ to the earth, this was borne in mind … by another ordinance [blood sacrifice], which was a type of the great sacrifice that should take place in the meridian of time” (Teachings of Presidents of the Church: Joseph F. Smith, 102). After His mortal ministry, Christ elevated the law of sacrifice to a new level. In describing how the law would continue, Jesus told His Nephite Apostles that He would no longer accept burnt offerings but that His disciples should offer “a broken heart and a contrite spirit” (3 Ne. 9:19–20; see also D&C 59:8, 12). Instead of the Lord requiring our animals or grain, now He wants us to give up all that is ungodly. This higher practice of the law of sacrifice reaches into the inner soul of a person. Elder Neal A. Maxwell of the Quorum of the Twelve Apostles said: “Real, personal sacrifice never was placing an animal on the altar. Instead, it is a willingness to put the animal in us upon the altar and letting it be consumed!” (“‘Deny Yourselves of All Ungodliness,’” Ensign, May 1995, 68). How is it we show the Lord that we have symbolically put ourselves upon today’s sacrificial altar? We show Him by living the first great commandment: “Thou shalt love the Lord thy God with all thy heart, and with all thy soul, and with all thy mind” (Matt. 22:37). When we overcome our own selfish desires and put God first in our lives and covenant to serve Him regardless of the cost, we are then living the law of sacrifice. One of the best ways to be sure we are keeping the first great commandment is to keep the second great commandment. The Master Himself taught that “inasmuch as ye have done it unto one of the least of these my brethren, ye have done it unto me” (Matt. 25:40). King Benjamin taught that “when ye are in the service of your fellow beings ye are only in the service of your God” (Mosiah 2:17). The degree of our love for the Lord and for our fellowman can be measured by what we are willing to sacrifice for them. Sacrifice is a demonstration of pure love. Sometimes the most effective way to teach a principle is to give an example of its use in practice. Let me share two examples with which I am personally acquainted, knowing as I do that many other Church members could share such significant stories of sacrifice by members of their own families. My great-grandfather, Henry Ballard, joined the Church in England, came to America, and suffered great privation while making his way west to Utah. Likewise, my great-grandmother, Margaret McNeil Ballard, endured much hardship crossing the plains as an 11-year-old girl. As I traveled along the pioneer trail with my family a few years ago, I found myself wondering how my faithful great-grandparents ever survived that trek and how it was possible for them to do what they did throughout their lives. Surely they came to know God and His Holy Son as they willingly gave all that they had to serve Them. Henry Ballard served faithfully as bishop of the Logan Second Ward for just a few months less than 40 years. His devoted wife Margaret served as Relief Society president for 30 years. Our commitment to the kingdom should match that of our faithful ancestors even though our sacrifices are different. Today in the Church we can find many examples to help us understand that sacrifice for the gospel is still essential and that coming unto Christ requires as much commitment and devotion now as it ever has. Not long ago, for example, I was assigned to preside over a regional conference in La Paz, Bolivia. Some members came from small towns and villages far away, showing great sacrifice and commitment to attend the meetings. Prior to the priesthood leadership training session, I greeted the brethren as they gathered. I noticed that one older brother’s shirt was a different color from the middle of his chest down; the upper portion was white, while the lower part was brownish red. He and three of his companions, all Melchizedek Priesthood holders, had traveled for many hours, walking most of the way and fording two rivers where the brownish red water came up to their chests. They had flagged down a truck and stood in the back of it for the last two hours of their journey. Do we have a similar attitude when we are asked to attend stake and ward or branch and district leadership meetings? We sing, “Sacrifice brings forth the blessings of heaven” (“Praise to the Man,” Hymns, number 27). This is a true principle. Let me illustrate with a personal experience. I was named bishop of a suburban Salt Lake City ward in 1958, in the days when local members paid 50 percent of the cost of constructing a building. One of the most important leadership experiences in my life came several weeks before the dedication of our building. Our ward of young families, struggling to make ends meet, still needed to raise U.S. $30,000. I fasted and prayed to know what I should say to them regarding this obligation. We already had pressed them very hard. “That night I received a wonderful manifestation and impression which has never left me. I was carried to this place﻿—into this room. I saw myself here with you. I was told there was another privilege that was to be mine; and I was led into a room where I was informed I was to meet someone. As I entered the room I saw, seated on a raised platform, the most glorious being I have ever conceived of, and was taken forward to be introduced to Him. As I approached He smiled, called my name, and stretched out His hands toward me. … He put His arms around me and kissed me, as He took me into His bosom, and He blessed me until my whole being was thrilled. As He finished I fell at His feet, and there saw the marks of the nails; and as I kissed them, with deep joy swelling through my whole being, I felt that I was in heaven indeed. The feeling that came to my heart then was: Oh! 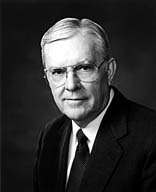 If I could live worthy … so that in the end when I have finished I could go into His presence and receive the feeling that I then had in His presence, I would give everything that I am and ever hope to be!” (Melvin R. Ballard, Melvin J. Ballard: Crusader for Righteousness , 66). The Spirit of the Lord touched the hearts of the faithful brethren in my ward’s priesthood meeting that day. We all knew that with greater faith in Jesus Christ, our Savior and Redeemer, we could reach our goal. During that same day, family after family came to my office with money, making personal sacrifices that were far beyond what I, the bishop, would ever have asked of them. By eight o’clock Sunday evening, the ward clerk had written receipts for a little more than $30,000. Sacrifice truly brought forth the blessings of heaven to the members of our ward. Never have I lived among a people who were more united, more caring, more concerned for one another than those members. In our greatest sacrifice, we became bonded together in the true spirit of the gospel of love and service. Sacrifice is still necessary if we are to develop faith strong enough to lay hold on eternal life. I believe we should increase our spiritual devotion and service to the Lord and others in order to demonstrate our love for Him and our Heavenly Father. Now as we contemplate the law of sacrifice in our lives, let us contemplate the environment in which we live. The blessings that have come to us in our times are monumental. We have need to guard carefully against ingratitude. The Lord said, “And in nothing doth man offend God, or against none is his wrath kindled, save those who confess not his hand in all things” (D&C 59:21). The spirit of the law of sacrifice promotes gratitude. We are living in a period of great prosperity that may, when history is written, prove to be as devastating to our souls as the effects of physical persecutions were upon the bodies of our pioneer ancestors. President Brigham Young (1801–77) warned: “Poverty, persecution and oppression we have endured; many of us have suffered the loss of all things in a worldly point of view. Give us prosperity and see if we would bear it, and be willing to serve God. See if we would be as willing to sacrifice millions as we were to sacrifice what we had when in comparative poverty” (Deseret News Weekly, 26 October 1870, 443). We would do well to remember the prosperity cycle found in the Book of Mormon when those persons blessed for their righteousness became wealthy and then forgot the Lord. Let us not forget the Lord in our day of prosperity. Let us maintain the spirit of the law of sacrifice and always thank Him for what we have, even if it is not as much as some others have. Listen to the language of the scriptures as they describe the level of sacrifice the Lord requires of us: “Offer your whole souls as an offering unto [God]” (Omni 1:26; see also Mosiah 2:24). “Present your bodies a living sacrifice, holy, acceptable unto God” (Rom. 12:1). The Lord Himself has said that we should keep our “covenants by sacrifice﻿—yea, every sacrifice which I, the Lord, shall command” (D&C 97:8). The sacrifice the Lord asks of us is to wholly rid ourselves of the “natural man” (Mosiah 3:19) and all the ungodliness associated with it. When we completely surrender ourselves to the Lord, then He will cause a mighty change in us and we will become a new person, justified, sanctified, and born again with His image in our countenances (see Mosiah 5:2; Alma 5:14; Moses 6:59–60). As in all things, our Lord and Savior manifested the supreme example of sacrifice. His divine mission was culminated as He gave His life for our redemption. Through His personal sacrifice, He provided a way for us to have our sins forgiven and return to the presence of our Father. I stand as a special witness today of this most singular event of all time. I testify of the far-reaching effects of this most holy of all offerings. In a future day of another life when our finite reasoning will be expanded, we will more fully understand the penetrating powers of the Atonement and feel moved even more with gratitude, admiration, worship, and love toward our Savior in ways not possible in this present state. If I have a fear, it is that the principle of sacrifice may be slipping away from us. This principle is a law of God. We are obliged to understand it and practice it. If being a member of this Church becomes too easy, testimonies will become shallow, and the roots of testimony will not go down into the soil of faith as they did with our pioneer forefathers. May God grant each of us an understanding of the law of sacrifice and a conviction that it is necessary today. It is vitally important that we understand this law and live it. Left: Detail from The Crucifixion, by Harry Anderson.